Ruth Cadbury has launched a local campaign to encourage schools and the Council to get tough on plastic in support for a proposed law to reduce plastic. 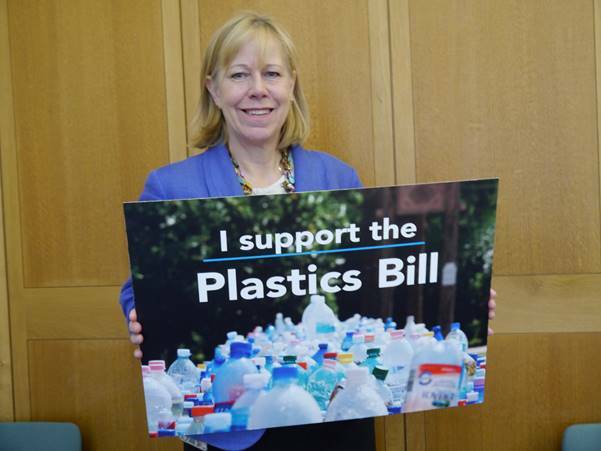 Ruth Cadbury was among dozens of MPs to support the new Plastics Bill presented by Geraint Davies MP which will ensure all plastic is recyclable by 2025 and would make producers pay for the cost of recycling. Ruth Cadbury said: "It's a crucial time to get serious about cutting out plastic in our communities and reduce its production and use. "By making the Plastics Bill into law we will ensure that plastic producers instead of local council tax payers pay for the cost of recycling plastic. The UK needs to take a world leading position having awoken the world to the plastics crisis with David Attenborough's Blue Planet. "Locally we need to set an example by reducing our own plastic consumption in schools, at work and in the council and I'll be lending a hand here as well as speaking up in Parliament. Currently 90% of the cost of plastic recycling is paid by our local council taxpayers so I'm supporting the Plastics Bill so the producer pays instead. This will encourage producers to innovate and reduce plastic pollution." "More than 200 schools across the UK have already signed up to the Plastic Free Schools programme run by Surfers Against Sewage so it's great that Ruth Cadbury is leading the charge in Brentford and Isleworth. "Unless we agree the Plastics Bill, if the UK leaves the EU we risk falling behind Europe where all plastic will be recyclable by 2030. Instead, the Bill would give the UK global leadership to help save our marine environment and ecosystems by requiring that all plastics in UK are recyclable by 2025 instead of 2042 as currently proposed by the UK government."